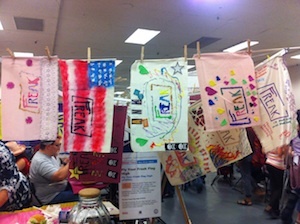 I had the pleasure of attending Maker Faire where I met Julia of the “Fly Your Freak Flag High!” movement. I didn’t have a chance to customize and personalize mine at the show but she was more than happy to give me one so when I got home I could put my touch on a recycled sheet freak flag they make. It’s a wonderful philosophy and movement I was happy to participate in be sure to pop on over to their Fly Your Freak Flag site to see and read more about it. You can see how I stamped my recycled sheet Freak flag with scissor rubber stamps I made here.